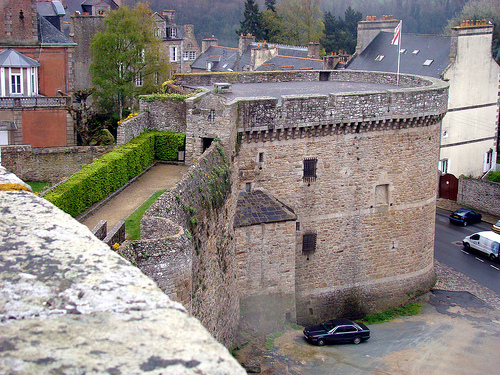 Château de Dinan was built by John IV of Montfort, Duke of Brittany, after his return from exile in England (1379). The site was particularly important to him: it was from Dinan, a strongly fortified city and commercial centre, that John organized resistance by the nobility to the threatened annexation of the Duchy by France. 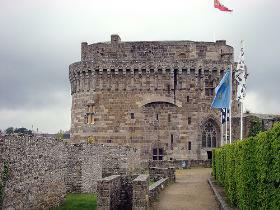 The castle, adjoining the city but independent of it, could both provide defence and compel submission in case of revolt: it was a substantial political symbol. 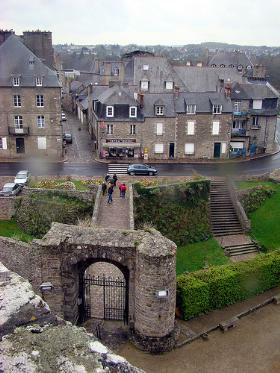 The castle, attached to the city ramparts, was enlarged in 1595–1598 by the Duc de Mercoeur through the annexation of the fortified 13th-century Porte du Guichet and the artillery Tour de Coëtquen (built 1474), both of which were part of the city walls; this ensemble forms the existing castle. The building was altered between 1693 and 1711 by the military engineer Garanjeau (in particular, the roof was suppressed and replaced by a terrace) and then by the Monuments Historiques and the city of Dinan, which are now responsible for its preservation. 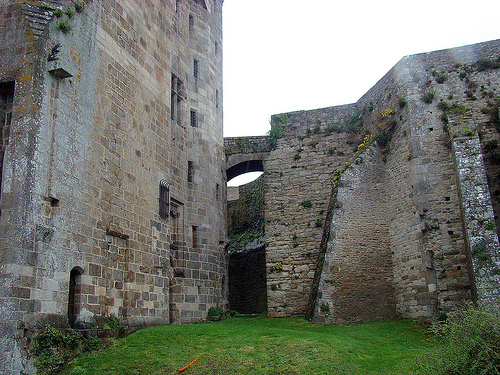 The main part of John of Montfort’s castle, built by Etienne le Tur and in use by 1384, comprises a massive donjon, 34 m high. 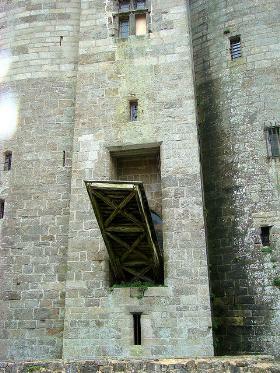 Its intricate plan is composed of two great round towers joined by a slightly projecting forebuilding, to which the principal entrance, defended by a drawbridge, opens on the ground floor. The donjon has five storeys, crowned by a parapet walk with machicolation decorated with trefoils and supported on long, elegant corbels; a sixth storey, covered with slate, formerly made up the upper part of the structure. On the opposite side to the projecting entrance block the donjon dominated a very small courtyard, which was provided with a postern and drawbridge leading to the outside and a well that controlled a complex system of water supply. While the exterior of the Dinan Castle has a fortified appearance, the interior is primarily residential. The floors are linked by a continuous spiral staircase. 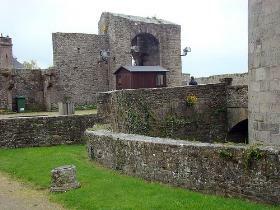 There is a kitchen on the ground floor, and the first to fourth storeys have the usual late medieval layout of hall and chamber, supplemented by garderobes and latrines etc. 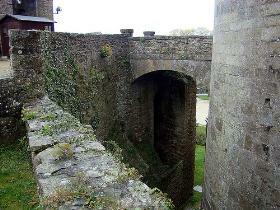 The rooms have huge fireplaces and are generously lit by large casement windows with mullions and transoms. 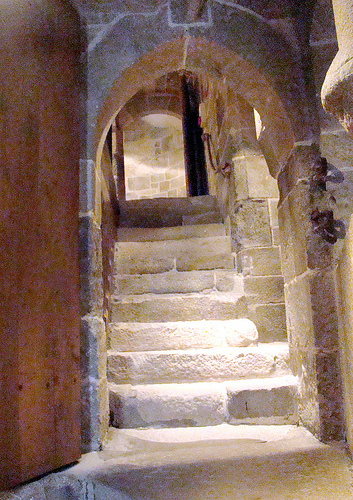 A chapel provided with a heated stall on the second floor completes this seigneurial residence. The donjon of Dinan is important in the history of Breton civil and military medieval architecture. 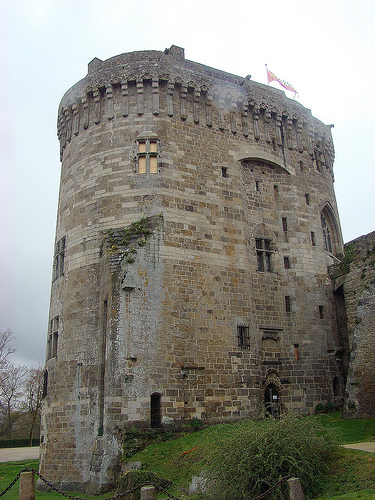 It was the outcome of a long series of experiments carried out by ducal architects: the first ducal donjon, Pirmil (1365) at Nantes, was nothing more than a strong, gloomy cylinder; the Tour Solidor (before 1371) at Saint-Servan was the first attempt to unite round towers in order to form a donjon of complex plan, but the living arrangements were crude. Dinan castle perfectly combines military considerations with efficient residential accommodation; and its skilful and subtle proportions enhance this achievement. Dinan Castle is own and managed by the municipality of Dinan. 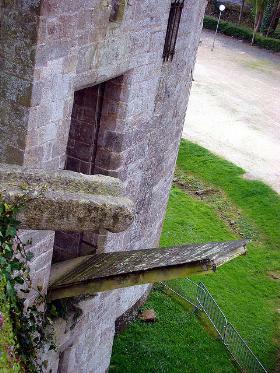 The castle is closed on 25 of December and in the hole month of January.